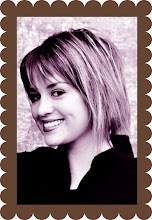 Introducing the Jenni B 2009 Spring Line! Take a look at the new items that are now available for wholesale and retail! 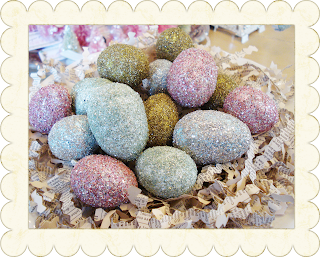 German Glass Glitter has inspired me to come up with several new products for Easter. I can't wait to show you because Easter is right around the corner! Mmm . . . This was my first glass glittered creation. It's an egg box with tiny pleated pages from an antique book and a touch of pink seam binding. They come in these pretty colors: silver (shown), pink, light green, and light blue. 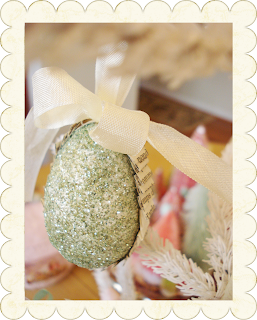 These glittered egg ornaments are already selling in my Etsy shop and I've had several wholesale orders already. Again, tiny paper pleats and seam binding for hanging. 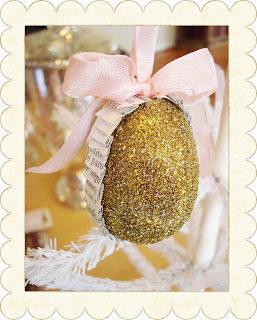 They're perfect to hang on your Easter tree! 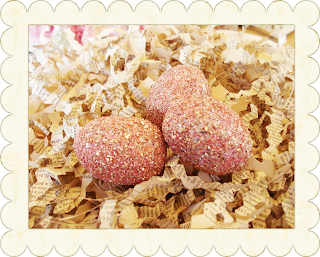 The mini glittered eggs come packaged with this French vintage book shred. So adorable! The eggs come in pink, silver, green, blue & gold. All the ideal Easter shades. 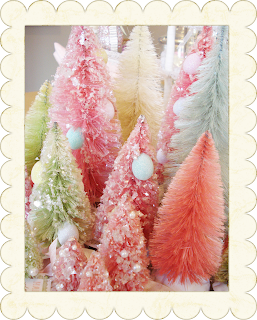 And these trees are just perfect for Easter. 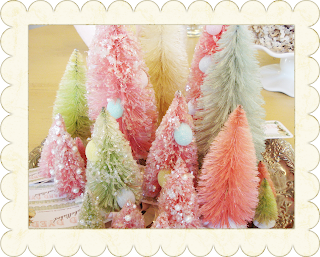 One of my customers had this to comment about these hand dyed and embellished Bottle Brush Trees: "The trees are just perfect and exactly as described. Just beautiful!" They come in pink, light green, aqua & cream. Little glittered eggs, pearls, and mica flakes are added for the final touch. 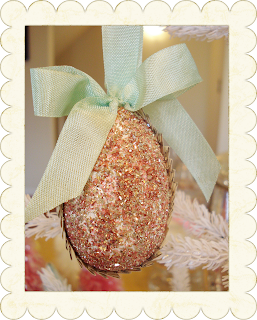 Happy Easter Decorating from Jenni B Originals! Spring, Spring, Spring . . .
. . . Is almost here! 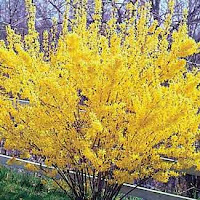 The Daffodils, Dogwoods, and Forsythia will all be blooming soon. It's the perfect reward for enduring a long and dark winter, don't you think? Wear red. If you're like me, the color of choice for the cold season is black. But there are so many great colors in style this season that will bring out your bright side. Red, bright blue, & purple are all in! Take a hike. Or just a little walk. Getting your blood pumping through your legs will bring color to your cheeks and a boost to your creativity while clearing your head. I should probably take my own advice on this one. Spring clean early. You'll be ready to enjoy the weather if you get to your Spring cleaning a little early. My advice would be to pick one day of the week to dedicate just one hour of deep cleaning. Starting from your top floor and working your way down to the basement, take one room (or floor if you have time!) and clean for one hour. Keep focused and don't stop until the hour is up. Set a timer to motivate you! Add a little color to your surroundings. Though it's just bhech outside, it doesn't have to be the same inside. Bring home some fresh flowers from the grocery store to enjoy throughout the week. Try taking big, brigh blossoms and arranging them in a short vase to set on the table to enjoy during meals. Be inspired. Just looking at pretty photos of Spring can bring something warm to your heart. Take a look at this flickr search of Spring Flowers. However, don't get carried away and look at all 553,513 images! Tutorial: Make a Giant Heart Valentine! This year, give your Valentine something special! A Giant Heart Valentine. 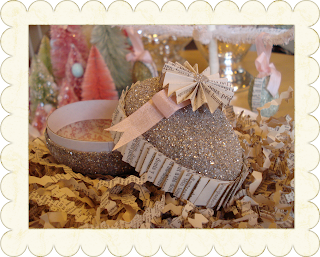 Handmade items are always treasured and this one can be saved from year to year! This is my first tutorial on my blog, so enjoy! 1. 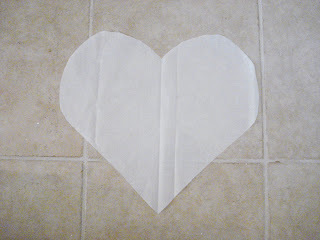 First, trace a large heart on a piece of tissue paper or newspaper. It’s easiest if you fold the paper in half and draw half a heart along the crease of the paper and cut it out with the fold still intact. Make sure your heart is big enough; 18 - 22 inches works well. Trim as needed. 2. 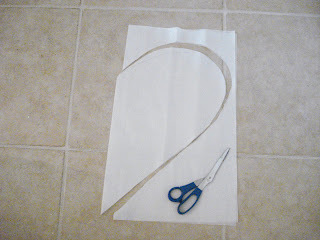 Trace the heart pattern twice onto poster board and cut out the two hearts. 3. Cover one of the hearts with your desired paper. I chose vintage sheet music. 4. Turn the heart face down and gather tulle and glue it around the edge of the heart with hot glue. Just work it a little at a time! 5. Glue the other heart on the back of the papered heart, sandwiching the tulle between the two. Hot glue works great for this as well. but you can put on any phrase you’d like. I also attached the letters to some paper medallions covered in mica flakes. Tip: Arrange your letters how you’d like them on the heart before gluing in place to get them evenly spaced. 7. Punch two holes in the top of the heart and thread ribbon through for hanging. 8. Write a special note to your honey and sign and date it. Give it to your sweetheart! Now, get to work and surprise your special someone. I've already had requests for three more of these!